Keywords make it simple for people to sign up for your messages. But how do you get your target audience to actually text in your keyword? 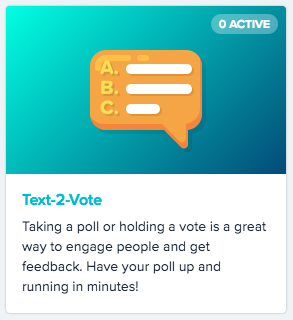 One way is to run a text-to-vote poll. In the example below let's imaging we're run an ice cream shop and want to ask customers to vote on our next flavor. 3. Create a keyword if you haven't already. If you have, skip this step. Your keyword is the word of phrase people will text in to your number to enter your poll. 5. Give your poll a name. This is just for your reference. 7. Write your poll question. Participants will automatically receive this question when they text in your keyword. 8. In the next box, write your answer choices separated by a line. SimpleTexting will automatically assign each choice a letter. 9. Write your follow-up message. Participants will receive this message right after they cast their vote. 10. You can also send participants the latest results when they vote. Just check the box. 11. Click Save and you're done. Start promoting your keyword and letting your customers know that you value their opinion! When you're ready to see your results, just click the eye icon.